Gentle hills, green fields, yellow hay and the purple spots of the lavender fields, wandering through Provence countryside is pure bliss. 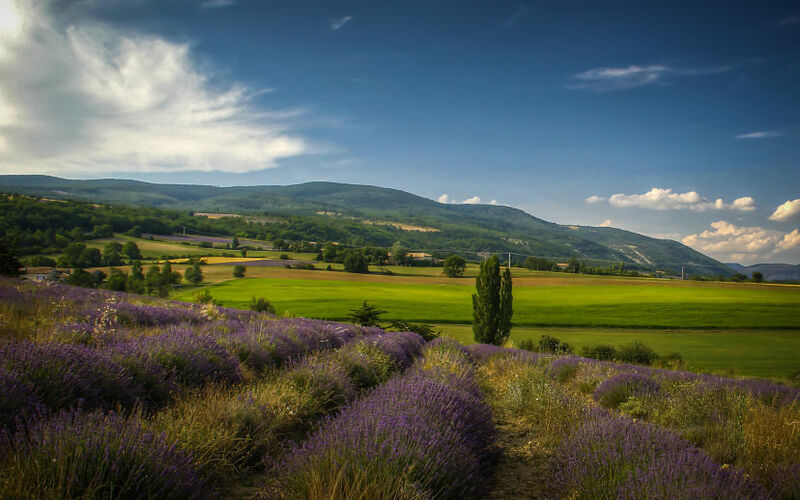 Everything in Vaucluse, the Department of Provence encompassing Avignon – the “City of Popes“, Orange, and the famous Mont-Ventoux, invites to relax and enjoy the tranquillity and beauty of rural France. There’s not much glamour in this area of Provence, and that’s exactly the reason it’s so enchanting. The countryside is almost untamed and little inhabited, with the exception of the pretty villages with their houses built in stones and the colorful shutters and windows. It’s a paradise for bike lovers, many of which you’ll meet along the route, climbing up the hills or rushing down. Vaucluse is also the land of lavender, blossoming from mid-June to the beginning of August, whose perfume is intoxicating. With its lovely old towns and the beautiful countryside, Provence is one of those places that one can hardly forget. Note: Warm thanks to Barbara from Atout France Italy and Daniela from Provence Guide for the invitation to discover this wonderful area of Southern France. As always, opinions and emotions are exclusively mines. I biked through the region several years ago but never managed to get a fantastic photo like the one in this blog. It is a fantastic spot to visit and I would happily return. That’s a great photo. Really captures the beauty of the area.